Prepare stuffing mix according to package directions. In a mixing bowl, combine soup and milk. Arrange chopped chicken in bottom of baking dish. Sprinkle with salt and pepper. Top with ham and swiss cheese. 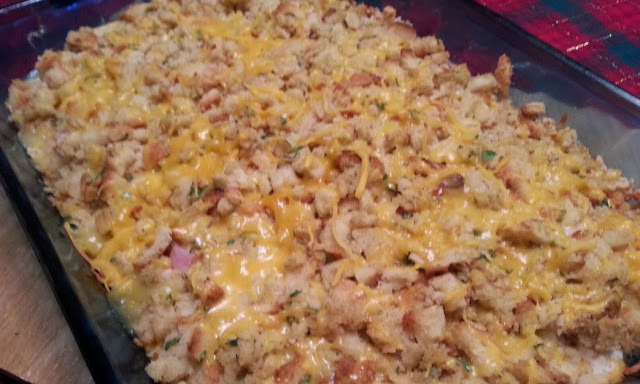 Pour soup of the cheese and top with stuffing. Sprinkle cheddar over the top. Cover with foil and cook for 35-40 minutes. During last 10 minutes of cooking time, remove foil and bake until cheese is melted. Enjoy!